Posted on February 14, 2018 by Betsy Jacoby-Greenleaf. Attendees and exhibitors are an integral part of trade shows. You can’t have one without the other. Yet we tend to show more attention to attendees because what resonates with them can determine the outcome of the show. We focus so much on the attendee experience that we don’t realize our exhibitors are paying attention. When it comes to “feeling the love” at trade shows, attendees have it in spades. This can leave exhibitors feeling like they have been dealt an inferior hand. Our exhibitors are invaluable, and it’s time to start showing them a little love. The best way to show appreciation and love for someone we value is by doing a little extra something special, just for them. First-time exhibitors need a little extra care. Don’t confuse care with coddling or babysitting. That is the opposite of caring for them. What they need is a little mentoring from someone with experience. Mentoring gives them the know-how to be successful. Show them that you are a leader that wants them to shine. Create an experience for first-timers that helps them learn the ropes. Offer them access to a webinar or conference call that walks exhibitors through the timeline of the show and what to expect. Share helpful tricks of the trade and “must-dos” with them. As a Show Manager, your position gives you certain advantages, like the ability to pull some strings for your first-time exhibitors. Some contractors and vendors are amiable to the idea of offering your first-timers special services, like small discounts on their orders for the year. Give your exhibitors a lounge space that is exclusively for them. This can be on or off the show floor. Don’t stress about the location, work with the space you have. Let exhibitors ditch the folding chairs for a bit with plush comfortable seating that they can relax on. Round tables with chairs to sit at and eat, drink, or catch up on some work. A small breakfast to give them the energy they need to get to lunchtime. And it’s one less thing they have to plan for because you have already done it for them. Charging stations for their phones, tablets, computers, and other USB devices. Around the clock coffee. Because coffee. We all want to see the fruit of our labor and experience that feeling of knowing that we are making an impact on the future. Exhibitors are no exception. Forming an Exhibitor Advisory Committee (EAC) gives your exhibitors a voice and representation; they can join the committee to give feedback, present ideas, or suggest changes. Encourage participation. The EAC benefits all exhibitors. They can gain valuable information by joining, like insight on industry trends and access to critical attendee evaluations. Continue the post-show love by sharing beneficial information that you have learned from the show. Post-show ROI data. Your exhibitors can gain valuable stats on how many attendees visited the show and receive feedback from attendees that visited their booth. You can offer your exhibitors further insights into what the overall experience was for attendees and what exhibitors could improve on for future events. News about new technology that will be implemented in (current and future) shows. How to maximize premium booth space. Booth location and how it correlated with the length of time visitors stayed at their exhibit. This can offer insight into the effectiveness of their location and sales strategy. Share data regarding exhibitor sales. This information can help them analyze sales they couldn’t close and sales that were successful. It provides accountability to both exhibitors and the company they represent. General show information, such as growth and future events. Provide additional information on attendance (projected and past) broken down by city/state. This can help them understand what venues are better for their specific industry. Offer high-level data for a fee. The potential for improving their marketing strategy is tremendous when all the specifics are revealed. This can help them be more goal-driven. Always encourage your exhibitors to participate in a post-show survey. Express how much you value their input. It helps you and your exhibitors make the experience better for everyone. Have them tell you what worked well for them and what was less successful. Be sure to ask them if they will return next year (and why or why not). Sometimes all someone needs is a little appreciation to feel like they can succeed. When your exhibitors experience gratitude for their hard work, it reaps many benefits. Happy exhibitors can influence your attendees’ positive experience. This can lead to more attendee ticket sales and possibly greater revenue from booth space rentals. Exhibitors might even be amiable to purchasing premium booth space for your next event. It also increases the likelihood that your exhibitors will tell their friends and colleagues about the positive experience at your show. 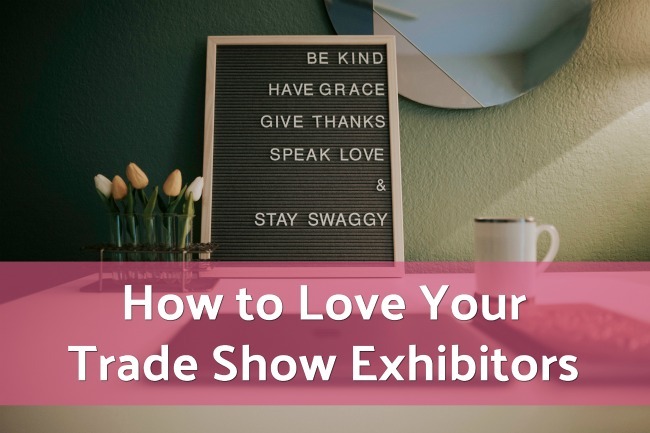 By showing your exhibitors a little TLC, you can get a reputation – the good kind! – in the exhibitor community, which can keep exhibitors coming back to your show. Events, Expo Planning, Show Management, Trade Show permalink.